For nearly a century, the plant on Holliday Street in Lynchburg has processed Virginia-grown meat. The facility was purpose-built as an abattoir and Seven Hills Food Co. are now just the fourth tenant in its long history. These buildings are a rarity in this era, often converted for other industry, into lofts, or even torn down. As a Community Development Financial Institution (CDFI), VCC can support projects like Seven Hills Food Co. because they align with VCC’s mission to create jobs, energize places, and foster an enhanced quality of life. VCC’ s focus on local and healthy foods seeks to address and end so-called “food deserts” across Virginia by supporting food-based businesses providing nutritious produce, meats, dairy, and more. VCC funded Seven Hills Food Co. with several other financial and government partners. 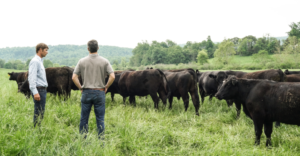 By working with agricultural producers throughout Virginia, Seven Hills is strengthening local food systems as well as revitalizing a meat processing plant in Lynchburg, VA. They provide processing services on a scale large enough to make locally raised meats more accessible and competitive. They work with both large and small producers in an effort to bring a variety of Virginia meat to the market. Seven Hills Food Co. employs a staff of 22 and hopes to double that number in 2018.